The electric corkscrew is a technological marvel that combines ingenuity, functionality and aesthetics and adapts to all necks and corks for extremely smooth extraction in a trice. Much more than a simple tool, the Peugeot electric corkscrew, with its ergonomic, contemporary, elegant design, is perfect for wine lovers and tech enthusiasts alike. 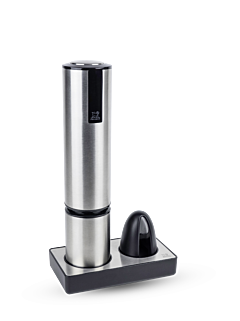 It is designed in stainless steel, powered by rechargeable batteries and only requires continuous and effortless pressure to open all bottles smoothly without any risk of breaking or crumbling the cork, whether it is natural or synthetic. Fast, efficient, easy to handle and use, with a powerful but totally silent motor, this top-quality rechargeable electric corkscrew and foil cutter, ensures the best bottle opening experience. The gift box describes the product benefits: a quintessence of aesthetics and innovation that will prove to be as beautiful as it is practical, in the kitchen or the dining room.